On one of our jogs around Hobart we saw the signs at the gates of the Botanic Gardens for the Spring Community Festival. Gardening and cooking demos in a lovely garden sounded too good to miss, so we headed along. It was cancelled on the Saturday due to intense winds, but Sunday went ahead as planned. 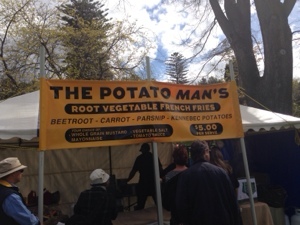 Festival food in Tassie is different, there was not a gozleme to be seen. 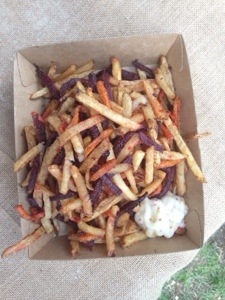 There were however root vegetable french fries. What a great idea! Beetroot, carrot, parsnip and potato for $5. And there’s your serves of vegies for pretty much a whole day – awesome! 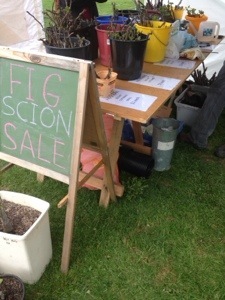 There were lots of great plant and gardening stalls even for quite a small festival, this one selling fig scions was pretty cool. Haven’t seen them sold like this before. 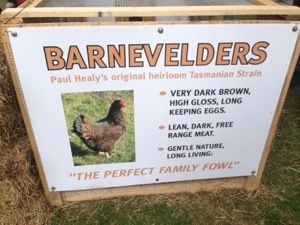 There were also quite a few sections with info about Tasmanian heritage breed chooks. 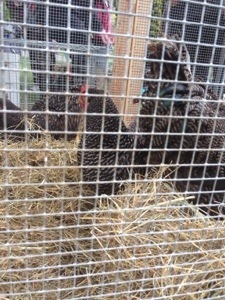 These Barnevelders were enormous and very pretty. 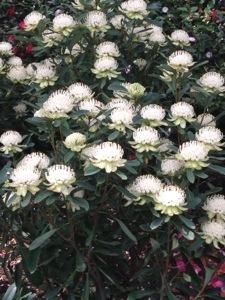 In the gardens proper there were these beautiful white Telopias. Lovely. 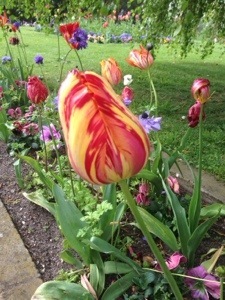 Tulips were also poking their heads through, adding to the spring feel. The garden itself has a sweet little old cottage which now has historical displays in it. 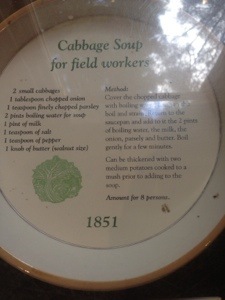 This seems to be where they got the recipe for the Cabbage Soup diet non? 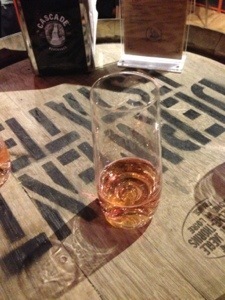 There was also music and more food and apple cider and the like. All in all rather a lovely way to spend an afternoon if you’re around Hobart. I love the trashyness of dude food, but in Oz it’s relatively rare to find a vego version of it that isn’t just beans and cheese in place of flesh. That’s ok in a burger, but for chilli fries you need some good old processed faux flesh to make it awesome enough to justify both the fussiness and the glorious disgustingness of the outcome. To make chilli fries you need to make two things: chilli (con quorn) and fries. You will also need cheese and jalapenos when assembling. First make the chilli, you can even do it the day before, maybe two days – chilli does just keep getting tastier as it waits to be eaten. You won’t eat a full batch on your fries obviously so it’s good for lunch or dinner for another couple of meals – just add cornbread on the side or rice or pasta like Americans do (weird). Chilli’s not really a recipe as far as I’m concerned, it’s something I have always cooked by feeling – mainly by copying what my mum did. Use your own favourite chilli recipe instead if you want! Heat oil in a large saucepan over medium, add mince and cook for a few minutes. Add soffrito and garlic and fresh chilli if using – cook until soft. Add chilli powder/cayenne and cook, stirring regularly until it smells good. Add tomatoes, stock cube, bay leaves and some water (about half a cup) and bring to boil. Then turn to medium and simmer for half an hour or until it’s as thick as you like and tastes good. Taste regularly and add salt pepper and any additional spices whenever you want. Potatoes – try find a variety that is good for fries (derr). Oil – canola or sunflower is fine. 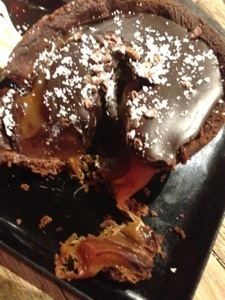 Heat oven to its highest setting – mine goes to about 260c which worked well. 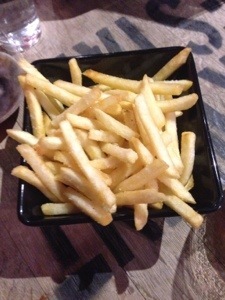 Peel potatoes or don’t – then cut into 1 cm slices, and cut slices into 1cm sticks. Blanch sticks in boiling water for 3 minutes, then drain and pat dry. Place chips into roasting pan (make sure they’re not too crowded! ), drizzle with enough oil so they are well coated and season with salt and pepper. Bake for about 20 minutes turning half way through until they are lovely and golden. 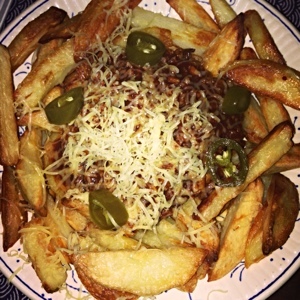 Place the fries on a plate or serving platter, heap on some chilli add some home pickled jalapenos (more of which another time) and grate on some cheese. Serve with beer. 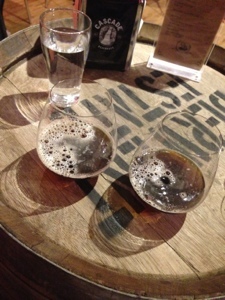 Lots of beer. 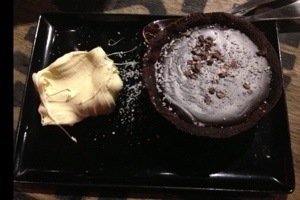 Have icecream for dessert.